In Korean, mukja means “Let’s Eat!” Food is an integral part of Korean culture, but beyond that, it celebrates an evolving identity that we are proud to represent in Portland. Korean dining is often loud, hectic, vibrant and happy—just like the phrase that names it, this festival strives to create a joyful, exciting atmosphere for everybody to enjoy Korean cuisine. The Korean American Coalition is a non-profit, non-partisan community organization dedicated to, among many other things, promoting Korean food, restaurants and chefs in the community. Our vision for “Mukja!” is to share and celebrate our passion for Korean food and culture with the vibrant Portland community we call home. KAC is proud to present an excellent lineup of award-winning chefs who will be feeding the hungry crowds at this year’s festival. 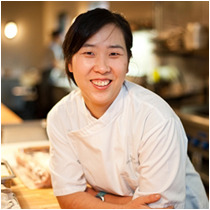 Hailing from various parts of the Pacific Northwest, they all share a deep love and appreciation for Korean food and flavor. Each $70 ticket provides entry at 2PM and a single-course sized dish from each of our 12 chefs and restaurant representatives, in addition to unlimited non-alcoholic beverages. Each $100 ticket also includes early festival entry at 1PM and a soju cocktail. Soju cocktails, makgeolli (unfiltered Korean rice wine), and beer will be available for separate purchase for all eligible attendees. Ride your bike! There will be plenty of parking for our two-wheeled friends surrounding the event venue. Hooray for public transit—streetcars will be running routes to and around the venue during the afternoon and evening of the event. Calling all designated drivers: Station Place Garage Lot 120 is located at 720 NW Lovejoy Court at the West end of the Broadway Bridge.